Google has topped a list of the world's most powerful brands, with new research estimating its value to be $86bn (£43bn). WPP-owned research company Millward Brown puts Google at number one in its annual top 100 global brand power list for the second year in a row with a 30% year-on-year increase in its value. Google beat General Electric to the top spot, with the NBC Universal owner's brand value estimated at $71.4bn. 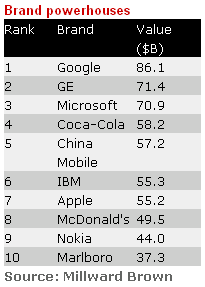 The next most valuable brands are Microsoft at $70.89bn, Coca-Cola at $58.2bn and China Mobile at $57.2bn. The top five remained unchanged year-on-year, with each company recording an increase in brand valuation by between 15% and 39% compared with 2007. IBM's brand value increased by 65% year-on-year to $55.3bn, moving the technology company up three places in the BrandZ list to sixth spot. Apple was the biggest mover in the top 10, and a new entry, moving up nine places to rank seventh, with a massive 123% increase in brand value to $55.2bn. China brands are moving up the ranking too. With China Mobile maintaining firmly in 5th place in the global study. Other Chinese contenders are China Construction Bank (31), Bank of China (32), China Merchants Bank, ICBC.